The Government on 31 May announced that it has identified Blocks 81 to 83 MacPherson Lane for the Selective En bloc Redevelopment Scheme (SERS). Blocks 81 to 83 MacPherson Lane comprise 313 sold flats, which are about 50 years old. Under SERS, the residents of these blocks will move to new replacement flats, sited in a nearby location and will also receive compensation for their flats based on market value at the time of the SERS announcement. HDB said that besides receiving payment of reasonable expenses (comprising removal allowance of $10,000 per flat and payment of stamp and legal fees) to help in the relocation, affected residents would also be assured allocation of a new flat at the designated replacement site. HDB said that purchase of a replacement flat at a subsidised price was frozen at the time of the SERS announcement. previous sale of a subsidised flat. of a replacement flat for couples who are first-timers and comprise one Singapore citizen and one Singapore permanent resident. Singles who own the SERS flat at the time of the SERS will get exemption from payment of $15,000 premium on top of the purchase price of a replacement flat. HDB will provide concessionary housing loan for replacement flat for eligible SERS flat owners, subject to credit assessment and prevailing housing loan policies. It will also give a comprehensive financial package to resident to help them ease the cash flow for purchase of replacement flat. Residents will also have the option to apply for a flat elsewhere under Build-To-Order (BTO) or Sale of Balance Flats (SBF) exercise with rehousing benefits and a 10% priority allocation. They will also be eligible for re-offer of Balance Flats (ROF) exercise with rehousing benefits. Eligible SERS flat owners may take also up an ex-gratia payment (up to $60,000) on top of their compensation instead of the SERS rehousing benefits. HDB will build new flats, ranging from 2-room Flexi flats to 5-room flats at Circuit Road, as replacement flats for the residents. These new flats are estimated to be completed in 2nd Quarter 2023. 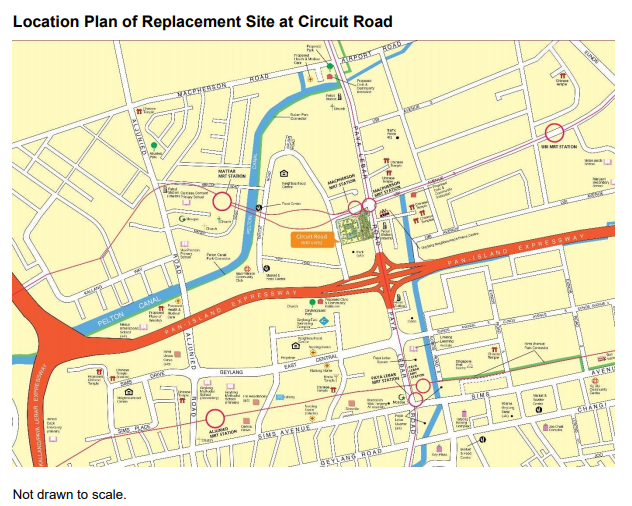 The replacement flats are located near the MacPherson MRT Station (interchange station for Circle Line and Downtown Line) and Pan Island Expressway. There are shops and eateries nearby, such as the Circuit Road Food Centre and the MacPherson Market and Food Centre. Paya Lebar Square is a few minutes’ drive away. In addition, residents can enjoy recreational activities at the nearby MacPherson Community Club. HDB said that it will inform all SERS flat owners and commercial property owners individually of these plans. They will also be invited to a SERS exhibition which will be held from 2 to 4 June 2018. The SERS announcement of the flats in McPherson is one of the first since the National Development Minister Lawrence Wong said that HDB flat owners should not assume that all old HDB flats will become eligible for SERS. Writing a blog in March last year, the Minister said that “only 4% of HDB flats have been identified for SERS since it was launched in 1995”, and that “it is only offered to HDB blocks located in sites with high redevelopment potential”. The Wong’s announcement on SERS spooked a considerable segment of the HDB flat owners as about 70,000 flats (of the 1-million HDB flats) are more than 40 years old, and almost 10 percent of flats will face lease expiry in 50 years. The Minister’s announcement essentially means that such flats will have zero value once it reaches 99 years and owners will have to vacate their homes. Most owners will see the land their flat was on being returned to the State at the end of the 99-year-leasehold. The public’s alarm caused the Minister to clarify that HDB flats are still a “good store of asset value”, so long as one plans ahead and makes prudent housing decisions. The assurance by the Minister failed to ease the concerns of some who asked ‘how in one fell sweep, HDB flats had gone from being “asset enhancement” to “good store of asset value”’.